It is still a pretty widespread idea that Japan, during two centuries of Tokugawa-led seclusion, was a unified monolith, managed peacefully and efficiently by the central powers in Edo. Within this narrow focus, one tends to omit the fact that the mavericks leading the Meiji Restoration had the difficult task of uniting to their cause a people dispensed over 260 distinct domains. At the outbreak of the Meiji Restoration Japan was messy and full of troubling divisions and, as one would expect, parts of the population couldn’t shake off the past or old loyalties with ease. This dividing line between old and new was carried out at a regional level, with some domains clinging to bakufu allegiances while others embraced the Satsuma and Chōshū alliance (satchō). The regional split is why the road to ‘modernity’ was not an easy one: on numerous occasions it took a bloody turn, the worst example being the Boshin War (1868-1869) which culminated in the disestablishment of the Tokugawa Shogunate and saw the return of the imperial court to prominent position of power. Far from ending the regional split (even through various collective and individual punishments imposed by the victors) the peace and stability following the Meiji Restoration was every so often disturbed by calls for regional independence, preservation of regional identity and historical revision of the actors of the Boshin War. All of these features had been drastically reduced, transformed and amalgamated as requisites of a newfangled, modern nation-state. The obstinate cries supporting the original form of these features were most famously and vociferously expressed by the defeated bakufu supporters, the people of Aizu domain. 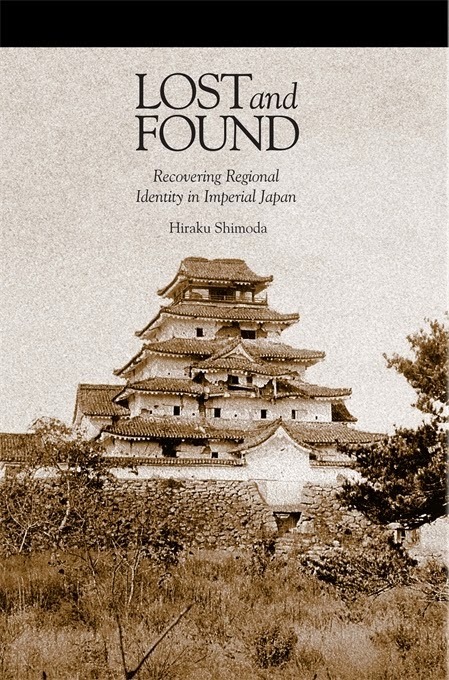 The circumstances which set Aizu apart and gave it the rare courage to clash with the increasingly-autocratic Meiji government are the subject of Mr. Hiraku Shimoda’s book Lost and Found - Recovering Regional Identity in Imperial Japan. Mr. Shimoda takes stock of a special topographical counterpoint to the notion of Japanese homogeneity and territorial uniformity by investigating a region where the strong local identity was often disconnected from the collective national ethos. In doing so, he confronts the massive reshaping of Aizu’s regional culture during the Meiji period and the resistance generated by such historical transfiguration. But if this local identity was so tenacious, so set against the forces building a nation-state (and, synchronously, an empire) then where is Aizu today? No political unit called Aizu has existed since 1868… One must squint at a map just to see the word Aizu appear as a mere vestigial prefix on the names of several towns and villages scattered across western Fukushima prefecture. The rulers and the ruled could diverge greatly on who and what ‘belonged’ in Aizu and how much they valued the domain as a rightful place of belonging that merited their allegiance. The domain did what it could, naturally enough, to keep human and material capital within its borders for the sake of domainal well-being. How is it possible that after the demise of their mighty Tokugawa supporter, Aizu became synonymous with a hotbed of ‘rebels’ and ‘enemies of the court,’ a mix of rowdy people who vehemently resisted and constantly frustrated forced amalgamation into the budding Meiji nation-state? And why, from this resistance, did it emerge as a primary exemplar of steadfast loyalty to the imperial cause? The reasons are interestingly varied and Mr. Shimoda presents them with the skill of a masterly historian. The anger increased in 1876 when Aizu was incorporated into Fukushima prefecture. Mr. Shimoda regards this move as the straw that broke the camel’s back because it gave the people of Aizu a platform to hold even more tightly unto to their views of regional exceptionality and resulted in pronounced demonstrations of local identity. It was the climate of modern national consolidation that fostered this local self-discovery. Faced with external violations of unstated but long-understood borders — an insensitive gerrymandering where Tokyo’s designs seemed grossly incongruous with established practices — some residents of former Aizu were driven to reaffirm local norms and discover their distinct locality. Both prefectural rule and administrative consolidation had aimed for nation-building efficiency, but those impositions gave rise, most unwittingly, to a sharper awareness of Aizu’s regional identity relative to its neighbours and the new nation. From this strong notion of personal and collective identity prevalent in the ex-Aizu province, the concept of Aizuppo became established. A singular definition of this term (which is in use even at the present) is hard to pinpoint. To be sure, it harkens back to the notion of “the Aizu spirit” that was invoked regularly and obsessively during the late Meiji Period to signify strength of character, loyalty and, above all, stubbornness in the face of drastic change and modern reform. “The Aizu spirit” was (and is) thus a thoroughly conservative notion, one that adhered to the acute exceptionalism of a supposedly unchanging tradition. The famous stubbornness of “The Aizu spirit” gradually began to be equated with steadfast loyalty which, in the nationalistic and military environment of the Meiji period, was the most admirable and supreme virtue the Japanese people could have. And because absolute loyalty toward country and emperor was the criterion that all good citizens had to demonstrate, the Aizu locals could now claim that they were the paragon, the embodiment of this moral attribute. Owing to its committed and unfaltering support for the Tokugawa government throughout history, the Aizu province had proven to be reliably loyal and so the designation of “rebels” attached to them and to all bakufu supporters in history textbooks had to be revised. The Aizu people couldn’t be rebels when in fact they most ardently and loyally supported the original Japanese state, seeing it through to its tragic demise. The sacrifices made by being on the wrong side of history were enough to warrant special consideration in the case of Aizu as it not only endured disproportionate humiliation and punishment compared to other provinces, but it eventually disavowed its ties to the old regime by taking down Saigō Takamori’s troops in the Seinen War of 1877 (otherwise known as the Satsuma Rebellion). All of this energised a grand region-wide movement in support of the elimination of the appellation of ‘rebels’ when referring to Aizu people, which even drew the passionate assistance of Tokutomi Sohō, the famous journalist and historian. Mr. Shimoda details with intriguing zest the well-publicised fight over textbook terminology but I cannot focus on this matter here. Nevertheless the report on this subject is one of the most exhilarating episodes in the book, well worth exploring. Aizu’s sense of difference — articulated through decades of identity rhetoric and captured by the idea of a so-called Aizu spirit — emerged out of an ultimately synthetic project whereby those who had once been deemed different sought to, and largely did, overcome that difference. In doing so, they could discover a homeland that satisfied local claims to legitimacy while ultimately confirming the nation’s supremacy. Thus an Aizuppo could be undeniably and unapologetically Japanese; in fact, there could hardly be an Aizuppo without a Japanese. Shimoda, Hiraku. Lost and Found. Recovering Regional Identity in Imperial Japan. Harvard University Press, 2014.